I invite you to download for FREE one topic from my CLOSE READING UNITS. The student pages match the text of the magazine. These pages are black and white because they are meant to be written upon. Students will highlight powerful words, circle specific details, underline important information, and identify surprising facts. Each passage is broken down into 3 parts. These manageable chunks allow you and your students to focus on the text without getting overwhelmed with the task of close reading. You might want to do one part a day and save these pages as notes. You can also use these pages for fluency practice. You will notice 3 smiley faces on each page. Each time a child practices reading the passage, they can color in one of the symbols. Once the three parts have been read and annotated, the students are ready to answer the comprehension questions. You can use these as an assessment. Each topic contains a full color 4 page informational magazine. 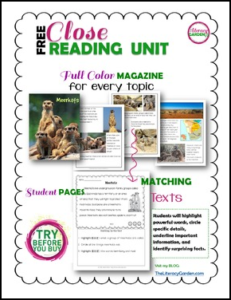 Not only do they motivate the reader, but they also provide authentic nonfiction texts for your class. The magazine can be displayed on your SmartBoard, document camera, or printed. You can get UNIT 1 and Unit 2 NOW!